Little one is the size of a pineapple (My midwife says she is measuring at 33 weeks). And according to our latest ultrasound, she is 4 lbs 2 oz. She is head down and looks perfect. At week 32, insomnia has officially kicked in. I don't get more than 2 hours of solid sleep, which most of the time is more like 45 minutes of sleep. Between bathroom breaks, baby kicks, and sore back/hips - sleep is a thing of the past. It makes me look forward to when Genevieve arrives. At least for the first 40 days nothing will be expected of me besides feeding my baby and getting rest. That sounds wonderful. Right now I am running on no sleep and I have to be at work 8 hours a day. I am definitely ready for the next season! On Monday my Papa (Maternal Grandpa) passed away. He was 98 years old and left a beautiful, full life with so much legacy. It was really hard to miss the funeral, but at 32 weeks, 8 hours of travel would be very difficult. I loved reading his obituary and remembering all the incredible ways he gave back to this world. He will truly be missed! His beautiful obituary can be viewed here. We went from grieving the passing of one Grandpa to celebrating my other Grandpa's 88th birthday. Between mine and Michael's family, he is the only living grandparent we have left. There is such a mix of emotions as we say goodbye to one generation and welcome in the next. It feels like a major season of our life is closing and a new one starting as my parents become the new grandparents. I was so excited to have our dear friends from Kenya come by the office. Pastor Benson and his wife, Florence, visited with their daughter and 2 boys from Fiwagoh (Pictured below). It was so great to see Nash and Duncan state-side! My VO family (co-workers) threw Michael and me the sweetest shower! We got the gift we were most excited about - our Sakura Bloom Sling! Baby Genevieve will be so cozy this winter while both Michael and I wear her. We topped off the week with our maternity shoot! Clearly we have a thing for pictures in nature - so it was only appropriate to take our maternity pictures outdoors too. Thanks, Felicia for the beautiful picture! After our maternity photo shoot we met up with our dear friends for a Sunday Brunch at Marche. We can't wait for Felicia and Tyler to relocate to East Nashville! And for their baby to arrive! 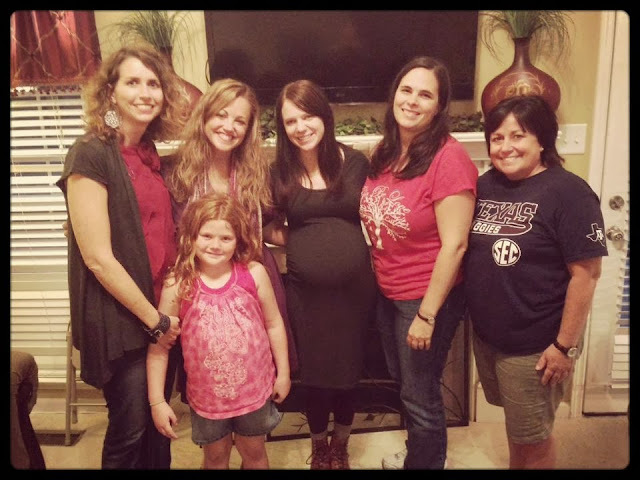 So many babies :) I love all of these ladies and their spouses. But by far, the highlight of this week was seeing our daughter one last time before delivery. At my 18 week ultrasound I found out that I had Marginal Placenta Previa. This just means the my placenta attached to the uterine wall really low, touching the cervical opening. With today's technology it is something that can be monitored throughout pregnancy to avoid anything serious from happening. It required that I have a follow-up ultrasound at 32 weeks to make sure the placenta shifted up as my uterus grew. And it did! It was such an answer to prayer. Had it not moved, our desire of having a home birth would not have happened. And it could likely have led to a c-section. I was beaming with joy when I found out all is well. We are moving forward with our home birth plans and are beyond excited! There will definitely be an upcoming post sharing why our family is choosing a home birth. I wish I got a better picture but the placenta was the main focus at the ultrasound and I was just so grateful that all was well that I didn't push for more than this image!